A while ago I developed a passion for English Paper Piecing and went searching through the WWW to find someone that could supply papers. 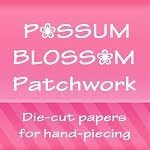 I stumbled upon Joannes e-shop – Possum Blossom Patchwork and have never looked back. Joanne is such a hard working and generous soul. Not only has she supplied me with top quality die cut papers to pursue my passion, Joanne has helped me out in the Inchy Hexagon Swap providing samples to our members as a welcome gift. Joannes products are exceptional and so beautifully packaged. Her service is without fault I have always displayed Joanne’s button on my blogsite (no strings attached. I do not have sponsors. If I like something, I will tell the world about it.) so that others can find their way to Possum Blossum Patchwork and fall in love with the magical world of English Paper Piecing. Joanne has now started a blog and is hosting her first giveaway. You can win some fantastic packs of die cut papers. While you are there take a look at her Flickr gallery. Wow, all of those hexies are superb. A true hexaculturalist. Love your hexis Joanne truly is a very generous person. Her Flick-r pics are amazing!! !